Only 12 days left to co-design this year's Festival! 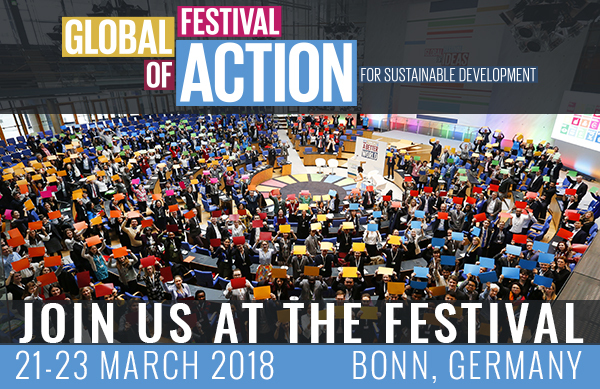 This new edition of the Global Festival of Action for Sustainable Development will be a diverse, dynamic and inclusive event for the international SDG community. We want to hear from you! If you have a panel to convene, a project to showcase, a workshop to run – relating to any of these themes, we want to hear from you! Applications are open until 15th January. Don't miss the chance to shape the action and discussions at the key annual gathering for the sustainable development global community. This year we want to recognise the most inspiring innovators, mobilizers, connectors, storytellers, communicators, visualizers and includers from across the globe. The UN SDG Action Challenge awards change-makers and celebrates critical contributions to the international sustainable development movement. Join us in this journey to discover and celebrate the individuals, organizations and local governments advancing the SDGs in the most transformative ways and driving positive change for a better world. Applications are open until 15th January. We need you to grow this community and keep the movement growing: Follow us on Twitter, Facebook & Instagram and share the news with your network. Let´s get this Festival started! Copyright © 2018 UN SDG Action Campaign, All rights reserved.